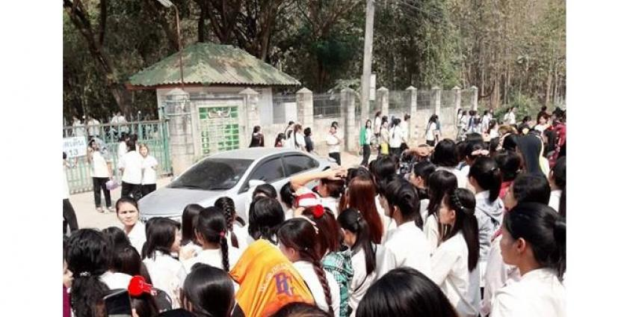 Over 1,000 Myanmar migrant workers from Golden File gem-polishing workshop in Bang Wang Takhian Village in the Thai border town of Mae Sot launched a strike on February 14 over the issue of not receiving full wage and getting their wages cut off for document fees. “They don’t give us full wage. They only give us 230 baht per day instead of 305 baht per day. They cut off the fees for the reapplication of CI (Certificate of Identity) from this 230 baht. As the workers have work permits and they are legal workers, we want full wage of 305 baht,” said Ma Thazin Htwe, also known as Ma Ah Shee, who led the protest. Ma Thazin Htwe said the workshop employer has not made any negotiations with the workers over this protest and some workers will leave if the employer fails to meet their demands and the employer told them to leave if they no longer want to work at the workshop. U Moe Gyo, a labor rights activist and chair of the Joint Action Committee for Burmese Affairs (JACBA), said the issue took place due to the exploitation of workers and lack of transparency in cutting off documentation fees by the managers and assistants rather than the employer. “High documentation fees of the Thai government are one issue. The manager and his assistants who are used to exploiting Myanmar workers act as brokers instead of working with official agencies [to submit] the documents and exploit [the workers] on the profits. The boss may not be aware of this. The problem rises up with the workers who couldn’t stand the double and triple exploitation,” he told Karen News. Around 1,200 Myanmar migrant workers are working at Gold File gem-polishing workshop and nearly all of them participated in the protest. According to Thai law, the current official wage has been set to 308 Baht up to April.